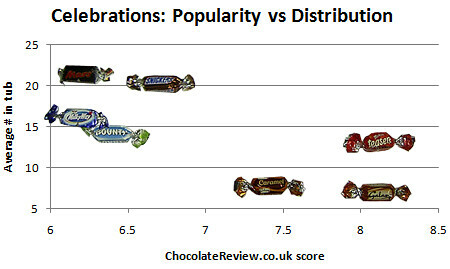 In the previous post I described my experiment regarding the distribution and popularity of the different chocolates found within a Celebrations tub. After several months of rumination, cogitation, and procrastination, I am ready to publish my findings. (Incidentally, this is fully the intended publishing style for this blog – posts appearing infrequently, but with a fair amount of thought and effort behind them, which is the style I prefer to find myself when browsing through the RSS feeds I subscribe to). I should note that I have since discovered some prior work in the field: popular newspaper The Sun reported on the unfair distribution of Celebrations chocolates way back in 2006, although their methods were not so rigorous. In response to claims of ‘scrooge tactics’, Masterfoods responded “The mix is made up of different quantities of various brands. Research shows that’s what people prefer.” We shall see how that statement holds up against a more scientific examination of the facts. The results of the auctions were, sadly, inconclusive. Only three of the tubs sold (the Mars, Maltesers ‘teasers’, and Galaxy tubs), all for the starting bid. I had thought I could at least use the number of views of each auction as a simple proxy for popularity, but on closer examination this seemed to have been biased by the order in which the listings appeared, with the first and last listed gaining a disproportionate number of views. Fortunately I discovered an alternative measure of chocolate popularity: The Chocolate Review, where different chocolates are scored out of 10, with most chocolates receiving over 50 votes. With this information in hand, I was able to plot out the relationship between the average number found in a tub and the popularity of a given chocolate. My worst fears confirmed: more delicious chocolates are rarer. First conclusion: the more delicious a chocolate is, the rarer it tends to be. 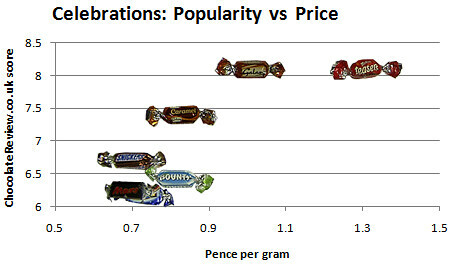 The correlation is clear but not perfect, and it should also be noted that the scores are for the full-size purchase versions of these chocolates, which differ somewhat from the Celebrations size – particularly the Maltesers ‘teasers’. Also note that the Galaxy Truffle is not scored on the Chocolate Review, although I strongly suspect that this would follow the correlation. (I have added the pricing and popularity data to the original results Google docs spreadsheet). Second conclusion: more delicious chocolates are more expensive, pretty much. Such is life. This brings us to the final and crucial question: is the distribution of Celebrations chocolates in a tub mercilessly determined by the average cost per gram alone? Price dictates distribution – but what of the teasers?. The Maltesers ‘teasers’ location is clearly an outlier. This is almost certainly due to the fact that these ‘teasers’ are significantly different to regular Maltesers, so the cost-per-gram used here is incorrect. Checking with two local shops I found the cost-per-gram of Maltesers to be the same, so the Tesco pricing was not an anomaly. Disregarding this datapoint, we can be fairly certain of the final and most damning deduction, which stands in marked contrast to Masterfoods’ disingenuous statement. Third conclusion: chocolate distribution is determined by price, not deliciousness. Fourth conclusion: Maltesers ‘teasers’ may well be more delicious than their cost would suggest, and could potentially be developed into their own independent product line. Further research is needed in this area, but I think for now I shall move on to other areas of research. Edit (07/04/2009): On the bottom of the tub, the ‘teasers’ have the following description: “Everybody’s favourite, grab ‘em before they’re all gone!”. It seems Mars (formerly Masterfoods) have indeed done some research, and it endorses my final conclusion. 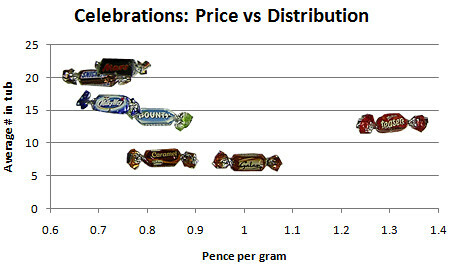 Second Edit (14/04/2009): A figure that was conspicuously absent from this analysis: given the standard distributions and cost-per-gram of each chocolate, a natural question to ask is: what is value of the standard tub contents? Assuming truffles cost the same as galaxies and that teasers actually do fit the distribution/cost trend, my estimate is £7.69. Since the standard price of a tub seems to be about £5, this means that these tubs are actually a very efficient way to buy chocolate. This data has been added to the Google Docs spreadsheet. Third Edit (17/07/2013): Much has changed in the ~4.5 years since this research was originally conducted. For one thing, the amount of chocolate in the tubs was reduced. Mini Twixes have now been added to the mix, (based on a couple of tubs, these appear to have largely substituted Mars/Snickers, so evening the distribution a little). Finally and most importantly, Mars did indeed launch a stand-alone ‘Teasers’ offering. Hooray! Fourth Edit (11/09/2015): These days there are only 750g of Celebrations in a tub, the truffles are out, Twixes are in. You can find out what the distribution looks like over on Mental Floss. This entry was posted in experiment and tagged bounty, caramel, celebrations, experiment, galaxy, mars, masterfoods, milky way, results. Bookmark the permalink. Aha! I have an explaantion for why people think the rare ones are delicious! It’s because they’re rare that they’re more desirable, and thus percieved as more delicious. People would probably rate Oysters as more desirable than pizza, but thats only because they associate oysters with a rare and gourmet treat, and pizzas with run-of-the-mill. If pizza was really rare and oysters common I contend the deliciousness scale would be different! So I believe that if milky way and mars were less numerous in the tin they would be more desirable! That might have been true if my measure of popularity had come from the eBay results, but since they instead come from the ratings on ChocolateReview.co.uk of the widely-available high-street versions of these chocolates, I don’t think it is the case! That said, there could well be such an effect for the Galaxy Truffle and the Malteasers ‘teasers’, since they don’t seem to be available in any other form. But I think the results for the other chocolates are fairly clear. Masterfoods say “The mix is made up of different quantities of various brands. Research shows that’s what people prefer.” You could read that simply as meaning that people prefer different quantities of different brands. Which they plainly do, as some are perceived as more delicious than others. Masterfoods are saying that they deliver different quantities of different brands. They’re not necessarily saying that their distribution correlates to the customers’ preferred distribution! Absolutely, that’s exactly how you could read it, but in the context it’s such a non-sequitur that it is very likely to be misread, which is why I describe it as disingenuous. Good point about the manufacturing difficulty of Maltesers (which I only now realise I have been misspelling all this time, I shall make corrections) – that seems very likely to be the reason for their relatively high cost-per-gram, and is a fascinating puzzle in its own right. Maltesers have been available since 1936, and in my mind at least have been largely identical throughout the time I’ve been aware of them (which is at least 30 years.) I would suggest that if it were any great manufacturing challenge to make spherical Maltesers rather than ovoid ones, then a) it would not have been practical to do so with 1936 technology and b) would have been the target of a revised design years ago. 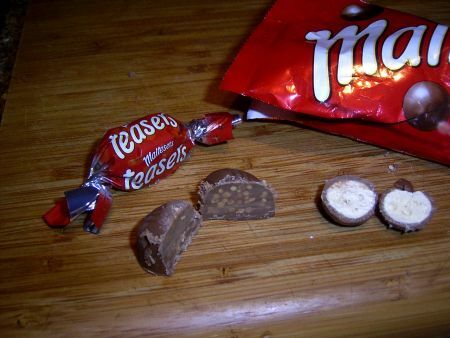 I would think that the ‘Teaser is so designed so that it fit within the Celebrations selection, in terms of size and density, rather than there being any kind of shortcut involved in its manufacturing. I agree the ‘Teasers’ are designed to fit with the selection, but I think the interesting part is that it seems in so doing they have stumbled upon a potentially profitable new chocolate to sell independently, since the cost-per-gram would appear to be less than the inferred deliciousness.